When summer is in full swing, cucumbers and chives are in abundance. And when there is an abundance of green goodness, we are going to eat it right up! However, if the season happens to be other than scorching days and balmy nights, we’ll assume that cucumbers and chives can still be found at the supermarket alongside all the other wholesome fruits and vegetables. No matter if it is in, or out, of season, this salad will cheer up the energy of the meal and bring smiles to everyone willing to take a bite. Now, that you have sourced and procured the best veggies possible, you’ll have to make your own homemade mayonnaise. It’s easier than you think, and mayo is so versatile! If you are sitting on the fence, waiting to learn how to make it, now is your chance. Start with a light olive oil and 2 raw egg yolks from free-range chickens. You’ll also find it beneficial to add some acid – lemon juice or apple cider vinegar – a little at the beginning, the rest at the end. Mustard is optional, use it if you have it, though mayonnaise is perfectly wonderful without. Whisk it briskly by hand or use a blender and let it emulsify slowly. Practice makes perfect. We often think of poultry when a garden-fresh salad comes to mind, but let’s challenge this notion and suggest to pair this crispy salad with beef steaks and mushroom gravy. It is a combination not to be missed. In a small bowl combine the mayonnaise, olive oil, vinegar, and season to taste. 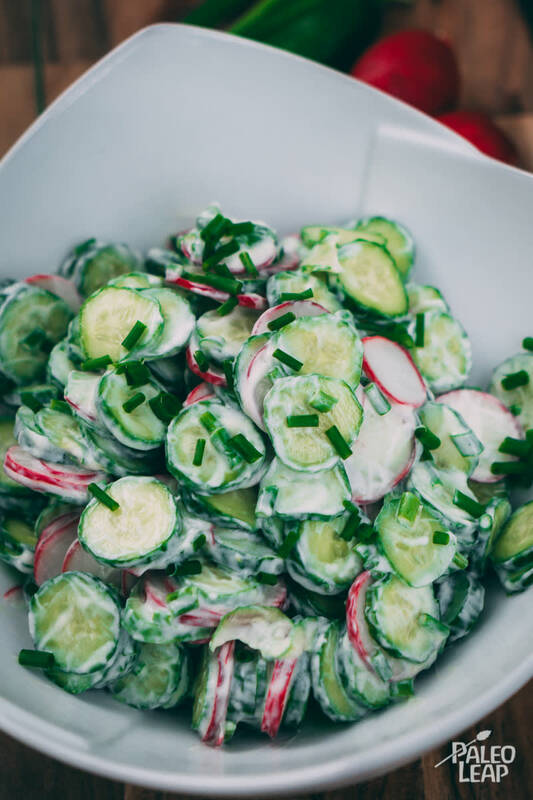 Add the cucumbers, radishes and onion to a salad bowl. Sprinkle the minced chives on top, and pour the sauce all over the salad. Gently toss everything until well coated and adjust seasoning if necessary. Refrigerate or serve straight away.